Learn one of the most practical, progressive and effective forms of combat with Muay Thai Kickboxing classes at Advanced Martial Arts and Fitness. One of the oldest fighting arts in the world, Muay Thai utilizes the use of eight weapons of the body including both fists, legs, knees, and elbows, with both, stand up and grappling techniques. What makes Muay Thai so popular and respected is its effectiveness in real situations, be it for competition, fitness or self defence. It relies on simple and efficient movement to generate maximum power and efficiency. Rather than pressure you to compete in ways that are not comfortable, our Muay Thai Kickboxing classes at AMAF give you options and choices on how you wish to train. Fitness classes are suited for most people, however, if you wish to gain more from your training experience our Muay Thai classes feature safe and modern training principles with a grading system to test and measure your progress. Do you still want more from your training? Why not continue your journey through to the higher grade levels to learn and discover the art of Muay Thai? Our Muay Thai classes range from the basic instruction on technique to competitive grappling and sparring. Our team encourages you to build your fitness at a steady rate, pushing yourself at your own levels to obtain a strong workable foundation for the future classes. Fitness Class (No experience): Our Beginner's fitness class in Victoria Park is structured to cater for both girls and guys with no experience, doing it for fitness and fun. Intermediate Class (Level 1 & Above): This class is for those that have graded to their first levels in our Muay Thai curriculum and therefore comfortable with the techniques and holding pads but want to learn more advanced skills. Advanced Classes (Level 3 & Above): This class covers all the skills required for moving through the next grade levels into and beyond Black Belt (Black Shirt). The focus here is on higher levels of fitness, pad work, and bag work, plus sparring and grappling. 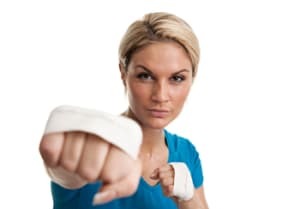 Morning Kickboxing: Can't fit our classes in after work? Start your day off with a total body workout that will boost your metabolism and help you burn calories throughout the entire day. Morning Fitness Kickboxing classes at 6 am and 9:30 am ensure that you can get in a killer workout no matter what your schedule looks like. Get started today - CLICK HERE to Sign up NOW for Muay Thai Kickboxing! Make the move to Muay Thai Kickboxing with our specially designed classes for all experience levels at Advanced Martial Arts and Fitness. Simply fill out the form on your screen for more information or to sign up and we'll take it from there!